Who doesn’t like the jungle? It is hot and humid, there are tons of mosquitos and many different animals that can kill you! But all this shouldn’t really matter for an explorer like yourself! 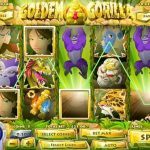 Your goal is to find the legendary Golden Gorilla; legend says that those who find it will be very very rich… If that’s not a good incentive then I don’t know what one might be. The Mad Gorilla is the wild symbol here and it will expand and substitute any other symbol (but the scatters) to create a winning combination. There are two scatters in the game. The first is the Gorilla Statue symbol. 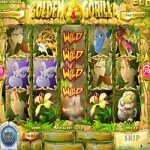 When you land 3, 4 or 5 of these you’ll get 15, 20 or 50 free spins respectively. The other scatter is the Dragon symbol. When you land 3 or more you trigger the Pick-A-Bonus feature where you get a guaranteed cash prize. This game has flashy colors that make it very catching that hide an average game. Yet, this game should still be worth a try if only for the many bonus features it has. Do you like gold? well who doesn’t…? 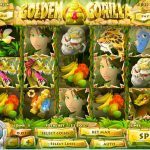 Try playing Gobblers Gold a 5 reel slot by Rival.